Are you looking for a fully insured and licensed tree service in the St. Cloud area? Pioneer Tree Service has been providing tree trimming and tree pruning, tree removal, stump removal, tree disease treatment and storm cleanup for homeowners and businesses in the St. Cloud area for over 30 years. Don't be disappointed, hire a professional tree service. Pioneer Tree Service offers tree removal and tree care from a trusted, local company with Certified Arborists. 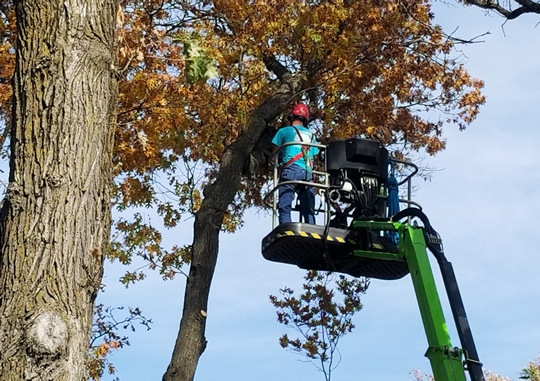 The tree service professionals at Pioneer Tree Service have been in business for over 30 years, with a dedicated crew, quality workmanship, affordable rates, fully insured, and Certified Arborists. Oak trees are sensitive to trimming & pruning during the warmer months of the year, and it is safest to trim oak trees during the colder fall and winter months. Trimming your oak trees in the winter months reduces the likelihood of spreading Oak Wilt and other diseases. Pioneer Tree Service has clean, dry Red Oak firewood available for your fireplace or wood burning furnace. Call (763) 238-5254 to schedule a delivery to your St. Cloud area home. Split fine. 4'x 8'x 16" face cord $125 (residential fireplace cord) or 2-full-cord load delivered for $550.